Dublin City Council plans to expand the 30km/hr speed limit across further areas of the city. SPEED LIMITS LABELLED as “ridiculous” by AA Ireland are not set to be changed by Dublin City Council, despite a “specific instruction” from the Department of Transport to consider proposed changes. In fact, Dublin City Council is recommending the rolling out of a 30km/hr limit in all residential areas between the Royal and Grand Canals, while maintaining the same speed limit on the quays in the city. 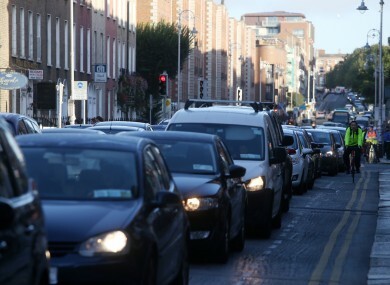 A public consultation on the issue of speed limits was launched by Dublin City Council in July. The council received 550 submissions. Of these, 100 supported the expansion of 30km/hr speed limits. The same number said reducing speed limits on its own is not sufficient, while 83 expressed concern that current city speed limits are largely ignored and enforcement needs to be improved. In the case of the submission from the AA, however, Dublin City Council was given a specific instruction by the Department of Transport to consider these proposals. TheJournal.ie has contacted the Department of Transport for comment. The AA proposed increases to the speed limit in the city centre and the quays, and in locations such as Fairview Strand and Cork Street. Their rationale for increasing the speed limit on the north and south quays from 30km/hr to 60km/hr was that the current limit was “ridiculous for a city centre commuter route” and that it added to traffic congestion. While pointing out that the proposals do not suggest “a blanket 30km/hr speed limit”, plans to introduce the limit would apply to “predominantly residential streets”, according to the council. They highlight that one of the main reasons for the change is to make “residential streets and areas around schools safer”. An additional Dublin City Council report adds that arterial routes into the city will retain speed limits of between 50km/hr and 80km/hr. A spokesperson for Dublin City Council told TheJournal.ie that the final decision on speed limit changes would be made at a full council meeting on Monday 5 December. Email “The AA thinks they're 'ridiculous', but Dublin City Council stands firm on 30km speed limits”. Feedback on “The AA thinks they're 'ridiculous', but Dublin City Council stands firm on 30km speed limits”.